Marques J. Clark is a husband, father, forward-thinker, educator and author. Born and raised in Oak Park, IL, Marques always had a passion for writing. He took an interest in poetry at an early age and had his first piece published in 8th grade. 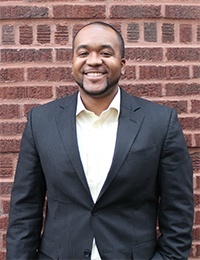 Marques received his Bachelor of Arts in Sociology and Master of Science in Higher Education from Northern Illinois University. Upon graduating, Marques started his entrepreneurial career as the co-founder of Aucity, a marketing and research company that develops strategies for engaging younger audiences in non-traditional ways. In 2016, Marques became the bestselling author of his first book, The Goodwill Fashion Lookbook. He currently lives in the Western suburbs of Illinois with his wife Kyndall, and son Micah. During his down time, Marques enjoys photography, traveling, reading, spending time with friends and family and binge-watching Shark-Tank. He is currently wrapping up the first installment in his Pop Culture in Education book series. Marques' personal mission is to help individuals reach their fullest potential through creativity and innovation and wants to continue to serve as a resource for those interested in discovering their passion. What better way to make your Goodwill shopping experience more exciting than by taking advantage of a few of Goodwill’s shopping resources? Check out The Goodwill Shopping Checklist if you are new to the Goodwill shopping experience. If you’re like me and are a frequent Goodwill shopper then you will love these! Now that summer is coming to an end it is important to start doing an inventory of your closet. Do you have any summer clothes that you won’t be wearing next year? Or maybe you’re preparing to purchase some fall clothes for the cool autumn weather and you need to make room in your closet. No matter what your reason is, consider donating your items to Goodwill. It’s really easy to do! If you’ve ever searched for a job online then you know there are many things employers look for. If you have experience in a specific job industry, then you might have an advantage when marketing yourself—depending on what the employer is looking for. But, what happens if you’re a recent graduate with limited work experience? Or, if you’re transitioning into a new career field that’s different from the field you have experience in? What do you do? Even many entry level positions ask for at least some experience before coming into a position. So, now you’re faced with this dilemma; how do you successfully secure a job that’s asking for years of experience if you don’t have that experience? The answer—An internship. If you’ve had an in-person interview before then you know that your appearance (see What to Wear to an Interview by Shopping at Goodwill and Tie Shopping at Goodwill for Your Next Job Interview) and the way you answer the interview questions can successfully land you a job offer. You’re also probably familiar with what takes place at the very end. After you’re done answering questions, which are supposed to show how much of a great candidate you are, the interviewer closes out with, “Well, now it’s your turn to put us in the hot seat. What questions do you have for us?” You don’t want to be the candidate who regretfully admits to not having any questions prepared. Failing to provide questions for the interviewer comes off as a lack of interest on your part. Not to mention, the awkward silence that comes with not having any questions can be very uncomfortable. Getting up and going to work can be a struggle sometimes. Especially when you’ve had a great weekend with beautiful weather, friends, family and relaxation. Finding something to wear to work can be even more of a challenge, especially when the everyday dress code is business professional. Over the past few weeks I have been showing outfit examples and strategies to use to find interview attire at Goodwill. (See What to Wear to an Interview by Shopping at Goodwill and Tie Shopping at Goodwill for Your Next Job Interview). Having excellent interview attire is extremely important when you are face-to-face in front of employers, but articulating what you bring to the table professionally is what will get you the job you’re going after. Before you receive the opportunity to interview, you need to show employers what it is that makes you stand out as a candidate. Your resume is the best way to show employers how you’ve made an impact in your previous positions. An in-person job interview is a great opportunity to make a visual impression as a professional. The interviewers pay close attention to detail. This includes shoes, hair, suit and especially your tie. When you’re dressing for your interview, you want to look professional and stylish. Goodwill is the best place to find nice, inexpensive ties. You can usually find any tie at Goodwill for under two three bucks. I recently went to Goodwill store in Aurora, IL (1543 Mesa Ln, Aurora, IL 60502) to find ties for a few upcoming interviews. I was extremely happy to find ties all for $1.50! Finding brand name items at Goodwill is not as difficult as it may seem. The secret ingredient to finding high-end pieces is having a little patience. I’ve found so many hidden items on the racks by taking my time and analyzing each piece before moving on to the next item. Goodwill is THE go-to place to find interview attire. New items are placed on the sales floor every day, which means you can potentially find something different each time you visit one of Goodwill’s many stores. Before an interview, I always visit Goodwill to find professional attire to wear. The average price of an interview outfit ranges from $40-$120. A good quality suit can start at $300 and retail for up to $800. I’ve used Goodwill to shop for my last three interviews and not only did I get the job, but I paid less than $10 for suits that normally retail for $400. Use the following tips to find your outfit at Goodwill for your next interview! Hannah Bonecutter is an accomplished, young woman with high aspirations and immense dedication. While earning her Bachelor’s of Science degree from the University of Illinois at Urbana-Champaign, Hannah became a licensed professional educator in Illinois. Since then, Hannah has taught and privately tutored students in all subjects and across all ages from infants to high schoolers. She also has experience teaching in a variety of different settings, including urban, suburban, private, and public.